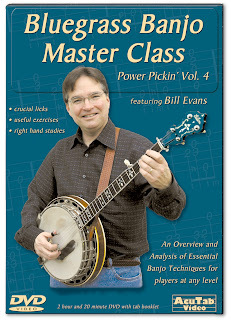 AcuTab Publications announce the release of their new Bluegrass Banjo Master Class DVD by Bill Evans. It aims to provide the most detailed grounding in bluegrass banjo currently available on DVD - both to set new pickers on the right track, and to refocus more experienced players on the basics: solid rhythm, big tone, and bluegrass drive. In 140 minutes playing time, Bill's teaching ranges from how to fit and shape the picks, and optimal tone and volume production, through playing with straight time or with a bounce, practice with a metronome, good posture, and relaxation while picking, to the building blocks of effective playing - 21 essential licks, and 20 chordal exercises to develop familiarity with the neck. More details are on the AcuTab website, including several screen shots and brief sample video clips. The retail price of US$35 includes a printed tab booklet. AcuTab products are also distributed by Mel Bay Publications, Inc..
Carmel Sheerin & the Ravens (# 1 European Bluegrass Band 2005) have a full two-week tour schedule in Tennessee, Kentucky, Illinois, and West Virginia from 5 to 18 June 2007. Full details are on their MySpace site. Carmel & the Ravens, plus special guests The Rabbetts and Sarah McQuaid, will play a special fundraising gig for the Irish Haemophilia Society at the Bog Lane Theatre in their hometown, Ballymahon, Co. Longford, Ireland, on Friday 13 April. The show has been organised by Tom Sheerin (mandolin and fiddle player in the Ravens) and his wife Claire, whose son suffers from haemophilia. The graduating class of IBMA's Leadership Bluegrass 2007, the eighth annual event in a series of intensive, three-day programs of advanced-level, interactive learning experiences that invite participants to examine the challenges and opportunities facing bluegrass music, along with related leadership issues. Full details are on the IBMA website. The EBMA congratulates all the graduates - and in particular Dagfinn M. Pedersen of Sondeled, Norway, and of Risor Bluegrass, Radio Risor, and the Norwegian Bluegrass Music Association. Dagfinn appears at the back, fifth from the right of the above photo. After hosting their own festival on 21 May at Bramsche, the Looping Brothers (Matthias Malcher, Ulli Sieker, and Bernd Nollenberg) of Germany are scheduled to tour in North Carolina, Virginia, and Tennessee for two weeks in June 2007. Thurs. 14 June: Cook Shack, Union Grove, NC; 7:00 p.m.
Thurs. 21 June: Pickin' Porch, Birthplace of Country Music Museum, Bristol, TN; 7:00–9:00 p.m.
Fri. 22 June: Floyd Country Store, Floyd, VA, 7:30 p.m.
Sun. 24 June: River House, Grassy Creek, NC; 4:00-6:00 p.m. The Looping Brothers were featured with their band GroundSpeed in an article by Bob Black in the August 2004 issue of Bluegrass Unlimited. Angelika Torrie of A.R.T. Promotions reports that the long-established California band Lost Highway, who have toured several times in Europe during the last ten years, now have a new website, which gives all details of their new members and their coming schedules. As reported earlier, the Foghorn String Band from Portland, Oregon, will be touring in Scandinavia from 29 March to 7 April. They will then begin two weeks' tour in Ireland, starting on 8 April at the Seamus Ennis Cultural Centre in Naul, Co. Dublin, and ending on 21 April in the Crane Bar, Galway city. Full details are on the band's website. The bands involved should arrive in Berlin on Friday 4 May at lunchtime; the program will include a concert, and a workshop on the following day, returning home on Sunday 6 May in the early afternoon. The venue for concert & workshop is the cultural youth club CAFÉ LIETZE in Berlin-Charlottenburg. Veit Döhler, Andreas Benkhofer, and Reinhard Gress report that the schedule is complete for Banjoree 2007, to be held at the ESW, Hagen, Germany, on 8-10 June. Workshops in all styles of 5-string banjo playing will be presented, together with two additional guitar workshops, open-ended sessions, sale booths, and a session concert on Saturday. Accommodation will be prepared. You can register online by filling out the form provided, and clicking on 'submit'! Workshop places are limited, and will be assigned on a 'first come, first served' basis. If a workshop is over-subscribed by the end of April, the organisers will try to offer an additional one in that field. You can also register for Banjoree 2007 without attending a workshop. If you only want to jam, exchange your newest musical ideas, or simply meet other musicians, you need only register for accommodation and - if desired - meals. Accommodation, like workshops, should be booked before the end of April. For further details, see the Banjoree website, which is being continually updated. On Saturday 24 March and Sunday 25 March, Greg and Janet Deering will present a Deering Banjo weekend at Eagle Music, 1 St Paul's House, Armitage Bridge, Huddersfield HD4 7NR, northern England. On Saturday there'll be a chance to meet Greg and Janet at 10.00 a.m. A showcase from 12.00 noon till 7.30 p.m. will include a presentation from Greg Deering, 'How to set up the best sounding banjo', and performances by Kieran Hanrahan and Tom Napper (tenor banjo), Howard 'Shep' Shepherd (plectrum banjo), Tim Howard (bluegrass banjo), and Paul Bienek (clawhammer banjo). Further details, including a draw for a Goodtime banjo, are on the Deering website. Thanks to FOAOTMAD for this news. Earl Brothers tour Ireland & Scotland, Sept.-Oct. The Earl Brothers from San Francisco - a four-piece band who list the Stanley Brothers and the Ramones among their influences - are scheduled to tour in Ireland and Scotland between 26 September and 14 October 2007. The tour is being handled by the Brookfield Knights agency. The band, consisting of Bobby Earl Davis (banjo, vocals), John McKelvy (guitar, vocals), Larry Hughes (mandolin), and Rob Mellberg (bass), also have a MySpace site. The Looping Brothers Bluegrass Festival will take place on Monday, May 21, 2007 at the Universum in Bramsche, Germany. Artists scheduled to appear include the Looping Brothers, Si Kahn and Dan Paisley & The Southern Grass. The event is part of EBMA's 10th European World of Bluegrass series of concerts and festivals during the bluegrass music month of May. For more information contact Mathias Malcher. 7 June: Menigheten Filadelfia, Oslo, Norway. 6:00 p.m.
8 June: Pinsekirken Filadelfia, Aalesund, Norway. 7:00 p.m.
9 June: Pinsekirken Tabernaklet, Bergen, Norway. 6:00 p.m.
10 June: Skudehallen, Skudenoeshavn, Norway. 5:00 p.m.
12 June Fredheim Arena, Stavanger, Norway. 7:00 p.m.
15 June: Filadelfia, Vennesla, Norway. 6:00 p.m.
19 June: Cultureel Centrum Evertshuis, Bodegraven, the Netherlands. 7:00 p.m.
23 June: Conferentiecentrum de Bettele, Zelhem, the Netherlands. 7:00 p.m. The tour by Dan Paisley & the Southern Grass (12-28 May) is being handled by A.R.T. Promotions in association with Strictly Country Productions. The Hotel & Landgasthof Ochsen can be contacted by phone: +49 (0)7221/83169; fax: +49 (0)7221/54410; e-mail; or via the website. Lluis Gomez reports from Barcelona that the Al Ras Bluegrass & Old-Time Music Festival will be held on Saturday 9 June at Mollet del Valles, with a line-up consisting of the Tom Corbett Band (USA/Spain), La West, Autopista-6, the R.C. Brothers, Sedo & Adria Garcia, and Five Points. Tom Corbett, an oustanding Californian mandolinist who has already released two CDs, will tour Spain from 23 May to 13 June 13th, backed up by three Spanish musicians: Ricky Araiza (guitar), Lluis Gómez (banjo), and Maribel Sanchez (upright bass). For further details, e-mail Lluis Gomez. Thanks to Olaf Gläsmer, the EBMA website now carries an up-to-date and user-friendly list of bluegrass and old-time festivals throughout Europe during 2007. The festivals are shown in chronological order - each with its title, the town and country in which it takes place, its website address, and brief notes on important aspects. This list, which will be kept updated, replaces a list drafted in 2004/5 as an aid to promoters and tour organisers. The new list should be a major resource for anyone interested in bluegrass and old-time music in Europe. Olaf Gläsmer, of Magdeburg, Germany, is well known as 'the Grassroots Philosopher', guitar- and mandolin-player and singer. Olaf reminds us that for those in Germany, or interested in the German scene, Rudi Vogel, of the band BluNa, is hosting the blog Blograss (to which the European Bluegrass Blog now has a link). Rudi has been assisting the exchange of information and news on bluegrass in Germany and the rest of Europe for many years. 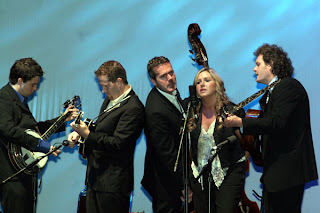 Irish bluegrass band Carmel Sheerin & the Ravens will tour the U.S. this summer. The band is currently finalizing their second album with multi-Grammy-winning Nashville producer Bil VornDick, who also signed them to a publishing deal. 'Very rarely do you get a chance to work with a family band of three brothers and a sister as the lead vocalist. There is something about family bands and their harmony that can raise the hairs on the back of your neck. They have the European flair in their music that is so appealing', said VornDick. The European Bluegrass Music Association (EBMA) voted Carmel Sheerin & the Ravens the #1 European Bluegrass Band in 2005, and they represented Europe recently at the International Bluegrass Music Association's World of Bluegrass conference that was held at the Nashville Convention Center this past September. Carmel Sheerin & the Ravens have scaled new heights in the past year and performed on the international scene, at a level most Irish bluegrass bands could only aspire to. In America, this band is being mentioned in the same breath as artists such as Alison Krauss, Ricky Skaggs, Rhonda Vincent, and Tim O'Brien. This is mainly down to the unique sound of Carmel on lead vocals and the band singing clean harmonies throughout. The forthcoming album consists of a lot of the band's own material, and some collaborations with top American and Irish bluegrass songwriters, including Tim O'Brien (IBMA Male Vocalist of the Year & Song of the Year Winner 2006), Charlie McGettigan, and Niall Toner. After moving to the USA a few years ago and after their visit to the Musikmesse in Frankfurt, Germany, The Krüger Brothers will be playing their first major concert event on April 1 at the Volkshaus in Zürich, Switzerland. Tickets are available from www.starticket.ch. Bluegrass Fest 2007 opens on 2 May with a concert headed by the Claire Lynch Band and continues on 4 and 5 May. Full details in English of the programme, artists taking part, location, transportation, etc., are on the Festival website. Advance ticket sales opened on 1 March; tickets are available through Ticketportal outlets in Eastern Europe or online. The website Bluegrass Wales has been recently launched 'to promote an understanding and appreciation of bluegrass music and those acoustic musical traditions from which it originated, and to encourage and support the enjoyment and performance of this music in Wales'. Bluegrass Wales also aims to promote venues where bluegrass can be played and enjoyed, to announce bluegrass events, to host workshops, and to provide technical information about performance and sound recording, instruments, and related topics. Regional bluegrass association Bluegrass in Basel has announced their programme for 2007. It features performances by The Jeanette Williams Band on March14, TriRhena Bluegrass with bands from the three countries surrounding Basel, Switzerland on April 24 (part of EWOB), the Second Bluegrass In Basel Festival (also part of EWOB) with the Stumptown Stars (USA) and others on June 14 and Chris Stuart & Backcountry (USA) on November 22. Over the last three years, IBMA has made financial resources available to foster the development of bluegrass music outside of the U.S. Twenty-nine grant applications have been funded during that time for a total of $50,000.00. Use IBMA World of Bluegrass events to expose international attendees to professional development opportunities and worldwide connections in the music. Offer direct support to bluegrass professionals and organizational development efforts which foster the music's opportunities outside the USA. Of the total allocated this year, $13,000.00 will be made available as scholarships for World of Bluegrass events (which may be used for registration fees, travel and/or accommodations), as well as other international activities which may be hosted during the convention. The remaining $7,000.00 will be available to fund new bluegrass projects which foster international cooperation and development outside the U.S. IBMA's International Outreach Program was introduced through the initiative of IBMA International Representative Paolo Dettwiler, chair of EBMA. Between now and 15 March we will put together the Guide to the 10th European World of Bluegrass. Please send any information that you would like to see published in it, as soon as possible! 1: Bluegrass (-related) events in May, in Europe: (give date - country - town - venue - time - contact information - performer(s)). These will be listed, free of charge. Any event counts, from festivals to small house concerts. All EWOB-related festivals will also be listed on the EWOB 2007 T-shirts. Rates for colour ads (limited availability) are double the above. Within the EU, add 19% VAT. 3: Sponsoring: we will accept sponsoring any time, but if you want the publicity, we should know about it now! Just to let you all know that the Jeanette Williams Band has landed in Frankfurt, Germany, today and thus has started its first multi-country European tour. The band may be seen at various venues throughout Europe (Germany, the Netherlands, Denmark, France, and Switzerland) and is even still available for very short-notice performances. Details of the tour may be taken from the A.R.T. Promotions website. Thank you for supporting the band and event producers with your attendance! Rainer Zellner's Music Contact agency reports that a further date has been added to the Wilders' first tour in central Europe. On 22 May they will be playing at the Frankfurter Hof, 55116 Mainz, Germany.